Gait improvement and rehabilitation has many benefits both for the patient and for the cost of ongoing health care. Providing increased mobility and balance a better quality of life and a reduction in hospitalisation and rehabilitation. The following systems cover a wide range of applications. The BalanceTutor’s technology allows the therapist to create a postural perturbation such as a slip or a trip. Its advanced technology utilises the platform’s movement in a medial/lateral and forward/backward direction while the patient is standing, walking or running allowing customised postural control practice in the specific gait phase that the therapist chooses to focus on. This allows for a vast range of physical therapy indications. It is the only rehabilitation system that employs an advanced 4D perturbation patented treadmill, multiple force and movement sensors and customised motivational video games. What is a postural perturbation? - A postural perturbation is a sudden change in conditions that displaces the body posture away from equilibrium. What is a reactive postural control response? - Reactive postural control response is an automatic “like reflex” response which is initiated by unexpected postural perturbation in order to maintain balance and can be improved through practice for example a compensatory step following a slip or a trip. What is missing in traditional physical rehabilitation? - Traditional physical rehabilitation is based mainly on proactive training (self-initiated actions). Clinical research has shown that in addition to proactive training, reactive training must be targeted. Traditional tools and methods simply can’t target reactive response training due to major safety issues and a lack of sophisticated treatment customisation. Why is the BalanceTutor leading a new era of physical rehabilitation? - The system’s unique technology for the first time allows training reactive postural control response while standing or walking at different gait phases. This is not treated in traditional practice. Together with proactive training the system allows for optimal rehabilitation outcome and recovery. The zebris Rehawalk system is designed for the analysis and treatment of gait disorders in neurologic, orthopaedic or geriatric rehabilitation. 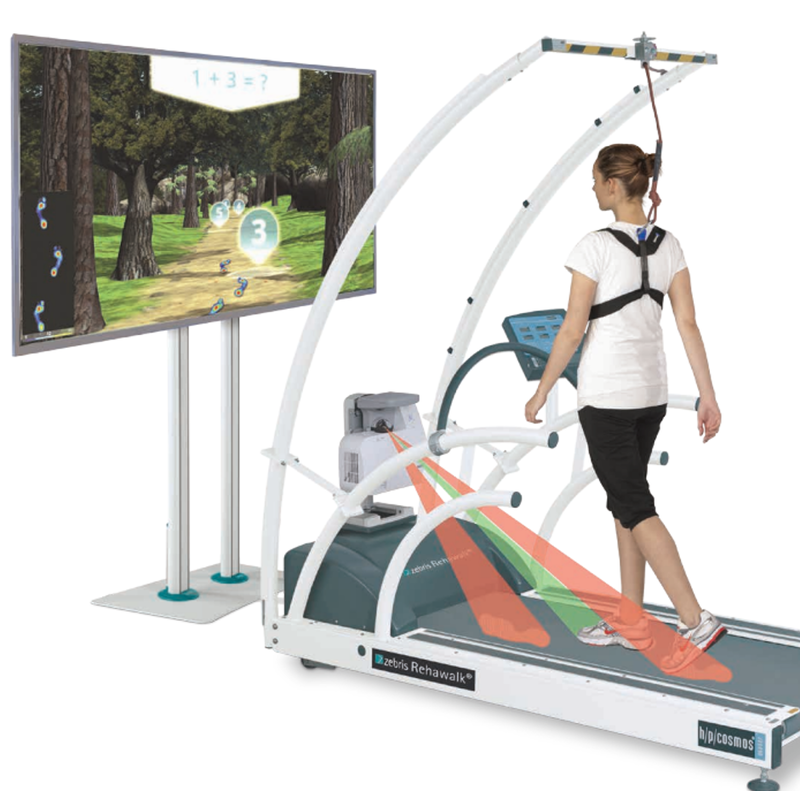 In addition to a treadmill, Rehawalk includes a unit for adaptive visual cueing through the projection of gait patterns on the treading surface. Virtual feedback training happens simultaneously with the help of a large monitor mounted in front of the treadmill. Therapy with Rehawalk assists patients in reaching a safe and effective gait through functional and cognitive challenges that can be individually adapted to the patient’s capability. Due to the high number of step repetitions, an automation of motion sequences is achieved providing complete protection against falling and additional weight unloading at the same time. The system automatically documents the course of treatment through the easy-to-operate software and in-depth evaluation reports. For recording kinematic parameters and video documentation, an integrated lighting and camera unit is optionally available. Gait Training - The gait parameters from a gait analysis are automatically populated and can be individually adjusted according to the training objectives. The values remain constant or gradually approach the target settings during the course of the training. During training the steps are projected onto the treadmill belt in the shape of the actual footprints. Throughout the gait training the patient is instructed to position his or her feet as accurately as possible within the projected surface area. Training is possible when using an un-weighting system and thus also allows for patients who are suffering from severe functional limitations to commence therapy at an early stage. The success report documents the adherence to the target settings. On that basis, the target parameters can be adjusted to the patient’s capability. For an optimal training control, two gait analyses are compared, e.g. before and after a training period. Virtual Training - The patient moves in a virtual walking environment, and while observing the footprints performs various tasks which require a continual variation of walking and balancing. Postural control as well as coordination skills are checked and trained as a result. The various modules allow the training to be individually adapted to each patient. Physical and cognitive abilities are simultaneously demanded during dual-task-training. The patient solves simple perceptual and memory tasks as well as arithmetic problems while walking. Thus, reaction time and attentiveness are improved while simultaneously supporting automated walking. In the course of the training, the level of difficulty can be varied and obstacles can be added.